A different kind of Remembrance Day for dead and injured, and the multitude of others impacted, is almost upon us. The deaths and injuries can be brutal, and more Canadian lives have been taken than in both world wars combined. The goal is not to prevent another mass slaughter. The carnage is an ongoing and increasing one. Our best hope is to start stemming the tide. A World Day of Remembrance for Road Traffic Victims was initiated by an organization called RoadPeace in 1993. Initiators conceived of a lofty goal: A day of respect by and towards all road users; a day on which exceptional care is taken by motorists; a day of courtesy at the wheel and a day when all road laws are respected so that a world day without any crashes resulting in injury or death will become a reality. The World Health Organization added its support in 2003. And in 2005, the United Nations provided international endorsement, encouraging governments around the world to commemorate the day. Canada stepped up in 2008, designating a National Day of Remembrance for Road Crash Victims. In Kelowna, a Day of Remembrance for Road Crash Victims has been proclaimed annually since 2012. 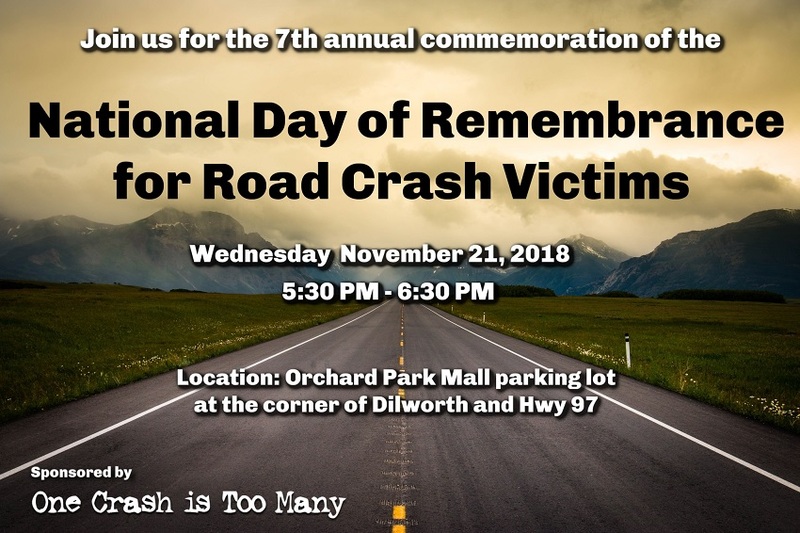 The seventh annual commemorative event will be held Wednesday evening, November 21, 2018, from 5:30 p.m. to 6:30 p.m. in the Orchard Park Mall parking lot, corner of Highway 97 and Dilworth Avenue. It will be cold and dark, but unless an emergency takes them away we will have Kelowna firefighters providing the flood light support of Engine No. 1. And we will do our best to keep you warm with a shelter, propane fire, hot chocolate, coffee and Timbits. I have been arranging the annual event as part of my One Crash is Too Many road safety campaign. 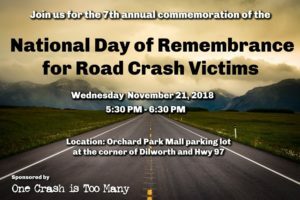 I agree that there is value in taking the time to reflect and remember the horrible personal toll that continues to be taken on our roadways. If we grasp the magnitude of the ongoing carnage, our minds will inevitably turn to how we might make things better. Because not one of us is immune. Each and every one of us, and those close to us, are in the line of fire every time we occupy our roadways. And that is not melodramatic. 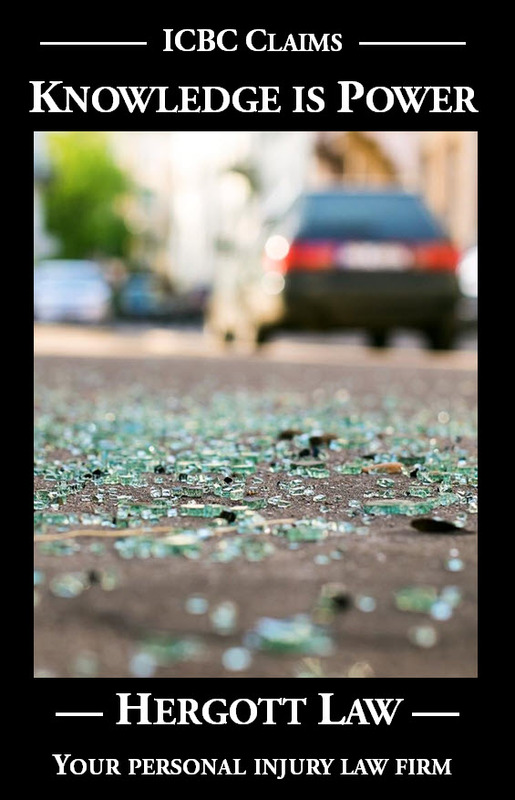 An average of 960 crashes occurred every single day in British Columbia in 2017. And the numbers are increasing. The more vulnerable we feel, the more motivated we will become to push our political leadership into action. Not politically expedient action that makes things worse instead of better, but bold steps to attack the root of our road safety disaster: Inattention. Crash numbers would plummet if drivers simply paid focused attention on the task at hand. But our political leaders are completely missing the boat on implementing obvious solutions. And when the road safety epidemic finally became a political issue, with soaring ICBC insurance premiums, the politically expedient answer was to strip away, instead of bolster, driver accountability by reducing the expense of crashes through stripping away the rights of crash victims. Many of us have been touched, some much harder than others, by a permanent crash injury or the loss of a loved one. Hideki Mimura is travelling from his home in Japan again this year to attend in memory of his daughter. Please consider joining us for the brief event on Wednesday evening. Please follow the link below to see our promotional video for this commemorative event.